We all know that LEGO isn't just for children. It's for children of all ages. So, don't worry, we know why you're here. Everyone wants to get some LEGO deals, because the more we love it, the more the prices seem to go up. 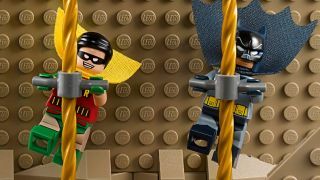 Batman Classic TV Series Batcave for $199.99 (was $269.99): Treat yourself to this classic Batcave Lego set - complete with a Wayne Manor area - before it's gone and finally put the Joker in his place thanks to this Lego Shop discount. Star Wars Kylo Ren's Command Shuttle for $69.99: Save an intergalactic $50 on this impressive craft that comes complete with a mini Kylo Ren and General Hux. Star Wars AT-ST Walker for $31.99 (was $39.99): Join the Empire and help find the Rebels before they get the Death Star plans with this Lego AT-ST Walker from Amazon. First Order Special Forces TIE fighter for $48.99 (was $69.99): With spring-loaded shooters and an opening two-minifigure cockpit, the Resistance stands no chance against you with this Lego TIE fighter from the Lego Shop. K-2SO for $19.99 (was $24.99): Rogue One's rude but loveable droid K-2SO now comes in Lego form and this Black Friday you can get a cheeky discount on him with the Lego Shop. Star Wars: The Last Jedi BB-8 for £74.99 (was £84.99): This Lego set has over 1,100 pieces and once assembled has a wheel-activated rotating head so you can feel like the real BB-8 is with you. Pick it up from Smyths now. Ghostbusters Ecto-1 and 2 Building Set for £41.97 (was £54.99): If Ghostbusters is more your thing, this is the Lego set for you. It's based on the 2016 all-female remake so comes complete with a mini Chris Hemsworth. The Ultimate Batmobile for £111.99 (was £139.99): To the Batmobile Robin! This incredible Lego set comes with eight minifigures, as well as loads of special features and with nearly £30 off, now is the time to get it. Thor vs. Hulk: Arena Clash for £45.35 (was £54.99): If Thor: Ragnarok was your favourite movie of the year, perhaps you want to treat yourself the Thor vs. Hulk: Arena Clash Lego set.